Welcome to the Solar O&M Insider, the first podcast series dedicated to solar PV operations, maintenance and asset management. This series is brought to you by Alectris, a global solar asset care innovation firm. Glenna Wiseman of Identity3 is your host. 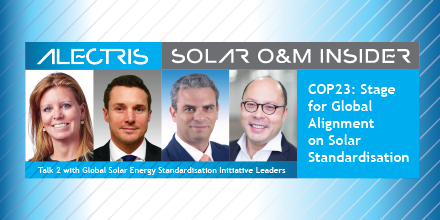 Our special multi-part series focused on The Global Solar Energy Standardisation Initiative or SESI features leaders of this initiative and those involved with the O&M workstream. SESI is a joint program of IRENA – International Renewable Energy Agency and The Terrawatt Initiative, along with SolarPower Europe and the Global Solar Council. Members of the operations and maintenance work group are developing a Solar O&M contract template that is one of seven integrated contract templates mapping each stage of solar PV development, finance, construction and operation. In this episode we explore why the upcoming COP23 Conference of Parties on Climate Change is important to the SESI program and what the SESI leaders intend to accomplish at the Bonn, Germany gathering of nations. Let’s start with Jean-Pascal and Bruce. What happens at the upcoming COP23 meeting related to the global solar energy standardisation initiative and why is it important for SESI and solar worldwide? Jean-Pascal: Maybe, Bruce, you want to start this time? Bruce: Clearly COP23 is important, generally for renewable energy, for solar specifically, and it gives us a great platform to discuss with decision makers within Europe but also internationally on the urgency of the climate issue and the role that solar can play in it. In our previous episode, we discussed the massive opportunity that is in front of us in terms of solar deployment and some of the barriers that exist. And SESI, the standardisation initiative, provides one of those solutions. It’s one of many solutions that needs to be implemented but we’re making great progress with it and it’s being widely accepted by the industry assuming it will be useful. So COP23 is a platform for us to present that, discuss with decision makers, and start rolling out this program of standardisation for solar development in current markets but also in emerging markets of Africa and Southeast Asia. Jean-Pascal: Yes. Absolutely. I think what you mentioned is very crucial. We need absolutely to socialize as widely as possible this idea of standardisation and show the benefit for each of the stakeholders of having a standardized set of documentation available in the market. We want to engage on this occasion not only with our peers in the industry and in the financial markets but also with other stakeholders, the governments in particular. COP23 is a good forum to meet with the high-level representatives of governments coming from all across the world and in one place and over the two weeks for doing that, which is absolutely exceptional. But there is also the presence of the civil society, the NGOs in particular, that are also very important to embark into this dialogue. Because what is at stake here is partly what they are expecting. And sometimes, they are seeing the industry as not enemies but, well, people that are not necessarily willing to achieve their goals. That’s not the case here and that’s very important that they understand that we are on the same side. We are actually trying to make it happen as fast as possible because we have also, as they do, the sense of urgency. Glenna: We spoke in our last episode–thank you, Bruce, for referencing it– that there are different factors related to streamlining and accelerating the adoption of solar PV across the globe and that one of those is standardisation but it isn’t the only one. Do you see these efforts as being–and to everyone that we have here with us today– how do you see that in terms of the emerging markets where some of the infrastructure of policy and modernization don’t necessarily exist? How can standardisation help jump start in emerging markets? Bruce: Maybe from our side, from the Global Solar Council, SolarPower Europe, I mean our members, what they face when they enter these new markets is enormous complexity. You can imagine for a developer entering markets in Africa, if they enter three, four different markets over the period of a few months or over the period of a year, and when they enter those markets, they’re faced with different contracts, different PPA contracts, different structures, different legal requirements, they start, as Jean-Pascal put it quite well, they almost start from scratch each time. And the transaction costs are high, the time frames are long, the complication is there. The standardisation has simplified the whole process. We clearly have industry buy-in to this. But we also need the public sector, the governments of these markets, to also support this, which will facilitate the development of solar at a lower cost. It will be faster at a lower cost and remove barriers. It’s especially important in those emerging markets which are not only emerging in terms of energy development and renewable energy deployment but also in terms of the legal frameworks, the contracts that are used. This will help them and ultimately speed up the development of renewables in those markets. Jean-Pascal: Yes, absolutely. I just wanted to add on that, Jean-Pascal speaking, that it’s not only useful for the developers and the companies from the developed countries to enter these markets but also and maybe mostly for developers and players, the local players that are starting in their country this industry as we did in Europe, in the U.S. 10 years or 15 years ago. And what we want to bring them with that is just the opportunity not to reinvent the wheel. There’s a lot of added value in this contract, in the standardized contract. As Sophie mentioned previously, yes, it’s lot of experience that has been put into that and really not reinventing the wheel, saving this very, very precious time is of the essence, this initiative. Bruce: I fully agree. And the huge advantage of this standardisation initiative is that its open source. Our members, which tend to be from developed countries who’ve already gone through the process of developing solar, are happy and really delighted that the Terrawatt Initiative and IRENA have opened this standardisation up to anybody. Organizations and companies from those emerging markets can use it themselves as a basis, an internationally agreed basis, for contractual relationships in solar. The second point is that although we’re talking about emerging markets here, the standardisation initiative goes much broader than that. And when we come on in a moment to talk about specifics of the O&M, the operation and maintenance contracts, there that is as useful, if not more so, in the developed markets. Where there’s already a significant solar installation, those contracts for operation and maintenance are crucial, again, from a transactional point of view, to simplify the process, and move that forward. In that context, ourselves at SolarPower Europe, we are organizing an event at the end of the year on the 7th of December in London to focus exactly on that. To talk to asset managers and O&M providers about this initiative and to introduce them to the standardized contracts for O&M. It’s on both sides, it’s an incredibly powerful tool, both emerging markets but also the developed solar markets. Glenna: I think the average person in the solar industry maybe doesn’t understand the implication of COP23, you know, on a day-to-day basis for their business. Jean-Pascal, I think that we feel maybe a little more removed from that process. Could you connect the dots a little bit for us about how COP23 really is important to this initiative of SESI and how it can really impact the solar industry worldwide? Jean-Pascal: I think the feeling you describe as the industry players to be a little remote from the COP journey and the UNFCC conference of the parties, the 23rd, is right. That’s precisely what we are trying to make is to connect the dots between what is, mainly an intergovernmental international process and the industry because these persons in the UNFCCC (The United Nations Framework Convention on Climate Change) and in these negotiations, the parties are negotiating climate goals. By the way, I should also remind that in the United Nations, in 2015, the sustainable development goals have been set and they are also setting general high goals, like the SEG7, to obtain affordable and reliable and modern energy for all or SEG13, which is climate actions. But beyond what these parties are negotiating and trying to organize from a governmental perspective, the feeling that we have is that we concretely don’t really know how to achieve that. They have given, especially COP21 in Paris, has given a real sense of momentum or political momentum, showing that what the goals and the targets were and what needed to be done in order to keep the global warming level to decrease and that was really important. Beyond the spreadsheets and the figures, it’s very difficult for them to know what to do. And that’s precisely what the industry can help with and now convert these general goals into concrete actions and concrete mechanisms in order to reach the level of development and deployment which are necessary to achieve concretely these goals. Each COP–and COP23 is one of these–it is important to have these discussions with the government saying, “Well, now you have set the goals. We have proposals to help you to get to these goals. And we are happy to discuss that and we are happy to explain how we see it possible to achieve that.” That certainly requires some changes for all the stakeholders, in particular, the governments. But everyone has to modify its way to do things and business as usual is not possible any longer. But it’s doable, it’s achievable. It’s also re-enforcing their conviction in the fact that it’s achievable and what they have decided is not only on paper, it can be for real. And it’s also showing to those who are a little less conscious about the climate situation…but it is also a huge business opportunity. And if they do not necessarily understand the climate issue, they definitely understand the business one. Glenna: We have this global framework that has been established with the Paris agreement, this global agreement that the majority of countries in the world have put the pen too, so to speak. Then we have this marketplace where there’s a tremendous amount of money and investment that’s interested in helping to build out the level of renewable energy that is needed on the planet, both from a climate change and a lowering the cost of electricity. We have this big umbrella situation, and then we have the mechanics of the seven contracts that the Global Solar Energy Standardisation Initiative is working on. Sophie, we’ve got this connect the dots sort of theme going on. Could you help us understand how those contracts, from your point of view as an international attorney, how can those contracts that are being developed through SESI streamline the process and help to–I know it’s a big question–help to really make happen, really realize the Paris agreement? Sophie: Absolutely. If you look at the normal time frame that the project development goes through and the time that the negotiations of each of the agreements takes, the fact that we now are developing a very standard suite of contracts that has completely aligned even when we might have different contractors and banks and market parties as parties to the agreement, the agreements are all intertwined. And so, what is force majeure on the one contract is completely aligned to another one. Where, for example, financing parties require certain availability guarantees to make sure that the revenues are there to cover the debts, this is worked into all of the contracts to make sure that there’s no gap between them from the first stage. It’s not something that once the agreements are all negotiated separately, then you put them together and there’s holes in them that, for example, would give reason to the financing party to say go back to the drawing table and re-negotiate the agreements. That’s no long going to happen. It has an immediate effect on the transaction cost of the development of the solar projects, which kickstarts the solar industry. All parties are able to rely on years of experience, not only on the contract side of things but mostly on the technical side of the solar market. But also on the commercial side of the solar market. There’s a whole development of this suite of contracts that takes away a lot of risks, thereby increasing the appetite for market parties to invest more in the development of solar projects. Jean-Pascal: If I may jump on that, basically, the purpose of the standardisation initiative is to reduce the cost, the transaction cost, by having a single set of generally accepted risk allocations. And the goals that has been set at the macro level, it is about the level of emissions. That means there are investments that have to be made into energy system in order to meet the needs. And there is a competition. There is a competition between the old fossil, or cheap coal, and the renewables. And this competition is mainly on prices, prices of electricity. A lot of countries, in particular, the developing countries, are now at the point where they need more energy. And they are at the point of choosing the technology that will serve their system. And having a lower cost of transaction and consequently a lower cost of solar electricity is one of the main arguments that connects the dots with the market goals is just to say, “Well, people will choose solar not because it’s green but because it’s cheaper, and cheaper because we are standardized.” And so, hence, we achieved the goals. Bruce: That’s exactly it, Jean-Pascal. The link there with COP23 is not necessarily with the Climate Agreement, it’s about delivering the solutions that could meet a Climate Agreement. In order to do so, you need solutions that are cost-effective. And governments are now waking up to that. The price of renewables, and specifically solar, have dropped dramatically over the last 8 to 10 years. The levelized cost of energy, electricity for solar has dropped something like 80% over the last eight years and will continue to drop for the next…well, into the future by another 10% a year. This standardisation initiative will facilitate that, will accelerate that cost reduction, simplify the processes. And this is not an incremental change we’re talking about. This initiative can bring about a step change in the development of solar because once the costs reach a certain point, it’s a tipping point that is reached. And if this initiative can push solar over that tipping point in certain markets, then you’ll see a massive deployment of solar that we’ve not seen before. It’s crucial. It’s urgent, and we’re pushing as much as possible, both the private sector, NGOs, the civil society, but most importantly, governments, to wake up to this opportunity to meet the climate goals through solar as fast as possible. Glenna: Vassilis, it’s really good that we have you on this episode because you represent both the development of standardisation efforts for SolarPower Europe’s O&M Task Force and also for the SESI Initiative but you are also in the field. Your team is in the field, your team is working on the digital solar front with software globally. How do you see the importance of this suite of documents and the work that you’re doing with SolarPower Europe to really reinforce what’s going on with COP23 and lowering the cost of electricity? Vassilis: What everyone has said on this call is absolutely right. It’s common knowledge. Standardisation is probably one of the most important steps of maturation for a specific industry. And I don’t think we need to argue a lot about that, we just need to see how other industries actually evolved once they’ve got some set of standardisation level. Look at the financial industry, look at the flight industry, telecommunications. I think essentially what we’re talking about here is something that is so common and self-explanatory, I would say, it’s just the fact that it hasn’t been done for solar yet. Standardisation and these comprehensive efforts, we’re not talking about to one specific thing like, for example, O&M or EPA standards or anything isolated, the fact that we’re talking about an overall standardisation of the industry, I think it’s a huge step forward. As we mentioned also in the previous episode, there’s been initiatives around the globe where isolated things or organizations, associations, have tried to standardize isolated things. I think the fact that what we’re talking about today is a global standardisation to reach a global level and a maturity level for solar that has not been imagined even before, I think it’s probably the most important step in the whole process in this industry. I firmly believe that this is going to be a key point for an exponential growth in this industry. We do see this growth already in the last years but the growth there has been more driven from the cost reduction. We’re just missing the last important detail, which is the standardisation, in my personal opinion, to make it really something that we further grow exponentially and sustainably in the whole planet, basically. Glenna: Jean-Pascal, what are your goals for COP23 in relationship to the SESI Initiative and what happens after COP23 in the next phase? Jean-Pascal: As I mentioned in the previous episode is that COP23 is really an important momentum for a large socialization of the standardisation idea and to have all the stakeholders engaged with us in the process so that everybody pushes in the same direction. It’s really, a moment of alignment of interests between all the stakeholders so that the standardisation and the standardized suite that is being drafted in this initiative be considered by the market as the reference. And people will use it because it’s efficient, because it’s simple, because it’s free, and also because it’s generally accepted. The next steps beyond the summits at the end of the year and the IRENA General Assembly in January will really be continuing this advocacy towards the market, show the benefits of it, try to also develop a very strong network of banks that are prescribing the standards. Because at the end, whatever the parties discuss along the lines, it’s the bank that decides what is acceptable and what is not. If the banks are promoting the standards, which is already the case for some of them, it’s a very good way to accelerate the adoption by the market of the standards. One other key feature that will come with that is the idea when you start to negotiate the project finance with the bank, you’re not only paying interest on the loan but you’re also paying fees for arrangement and negotiation of the contracts. Basically, if we can have some banks or most of the banks saying, “Well, we’re reducing maybe 80% of the fee just because the parties are using the standardized documentation,” would be a complete change in the industry. And a very rapid shift to this documentation is to be expected because no one wants to pay five times when they can only pay one. Glenna: Excellent. We look forward to touching base with you and finding out how the COP23 went for the SESI program. We thank everyone who participated in this conversation related to the Global Solar Energy Standardisation Initiative and the conversation around it at COP23 this year.